Actors and their roles can either be career-makers or underminers. Or both. Twenty years ago, Cuba Gooding, Jr. won a best supporting actor Oscar as pro football receiver Rod “Show me the money” Tidwell in Jerry Maguire. He followed that up with another hit feature film, 1997’s As Good As It Gets. The respective directors were Cameron Crowe and James L. Brooks. It doesn’t get much better than that, but Gooding had to learn this lesson. The duds that made it to theaters -- 2007’s Norbit and Daddy Day Camp -- put Gooding on the receiving end of two Golden Raspberry nominations for Worst Actor of that year. He instructed his agent to show him the director. 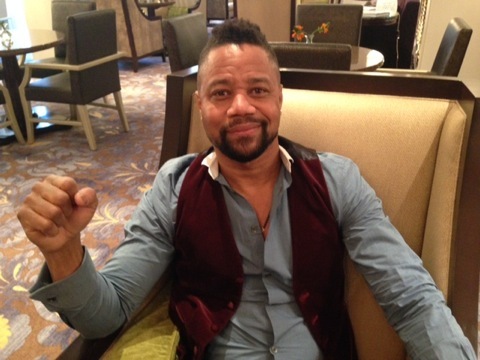 And Gooding’s choices markedly improved, with supporting roles in Lee Daniels’ The Butler and Selma leading to his casting as the central figure in executive producer/director Ryan Murphy’s first edition of American Crime Story (Tuesdays at 9 p.m. central), which like American Horror Story will have different stories and characters each season. Gooding says he was the first to be cast in a 10-part series that also includes John Travolta as Robert Shapiro, Nathan Lane (F. Lee Bailey), Sarah Paulson (Marcia Clark), Courtney B. Vance (Johnnie Cochran), David Schwimmer (Robert Kardashian) and Connie Britton (Faye Resnick). 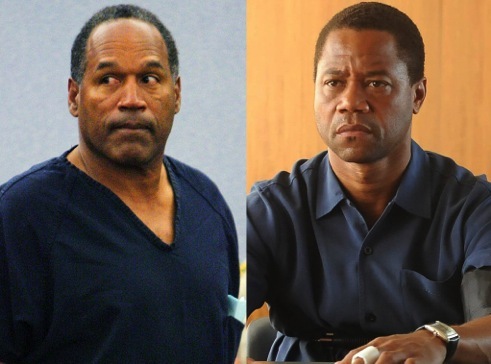 Gooding has met O. J. Simpson just once, in 1991 at a nightclub shortly after co-starring in Boyz n the Hood. Gooding, in his early 20s at the time, aspired to be just like him. “Oh, absolutely. I said, ‘That’s the Juice.’ “ Three years later, Simpson was indicted for the murders of Nicole Brown Simpson and Ronald Goldman. Simpson was found not guilty in what remains the most-chronicled and divisive celebrity trial of modern history. But he’s been behind bars since 2008 after being convicted of armed robbery and kidnapping in connection with trying to retrieve sports memorabilia that he claimed had been stolen from him. According to various reports, the incarcerated Simpson wanted Denzel Washington to play him in any TV or feature film and considers Gooding to have too small of a head for the role. “He’s got a huge head. What are you gonna do?” says Gooding, who had no interest in meeting Simpson beforehand but did spend considerable time with future Republican presidential candidate Dr. Ben Carson while preparing to play him in the 2009 TNT movie Gifted Hands: The Ben Carson Story. Simpson very much got into his head anyway. “I’d never been in a character this long before,” Gooding says, noting that his 2013, six-month run on Broadway in The Trip to Bountiful “was just one set off scenes that we re-visited over and over again. This was many different scenarios and emotions that I had to relive every day for a long period of time. Almost to the point of schizophrenia at times. And that wears on your psyche. It took me about a month to not think of dark images and dark thoughts, and think that they were my thoughts. Gooding is keeping his views to himself. Should Gooding be nominated for any Emmy or win one, it would be only the second time in 20 years that he’s been up for a major acting award. Two decades ago, when he won his Oscar, Gooding was the only African-American among the actors and actresses in the lead and supporting categories. In the past two years there have been none, prompting the #OscarsSoWhite campaign to diversify both the Academy of Motion Picture Arts & Sciences membership and the types of films being made. Gooding, a voting Academy member since 1993, says “you can’t really say there’s a conspiracy with the nominations to keep blacks out.” He’d like to see more movies made by and starring minorities, but doesn’t support a boycott. But he knew nothing about filming on a set when the Hill Street producers hired him to spout the line, “I’ll cut you, man!” Instructed to “hit your mark,” Gooding says he had no idea what that meant. After the third take, the director cursed him and pointed to the tape on the floor where Gooding was supposed to land so that cameras could frame him correctly. He finally got it right on the fourth take. The role of O. J. Simpson arrived nearly three decades after Gooding flailed about on Hill Street. “I’ll cut you, man” still eerily applies. But Gooding at age 48 seems to have wised up again after wandering through all those ill-considered film choices. It’s already been announced that the next installment of American Crime Story will focus on Hurricane Katrina and the “crimes against humanity” that went hand in hand. Will Murphy again go the repertory route, as he has in American Horror Story, by casting some of the same performers in different roles? Gooding smiles coyly and is non-committal. But his body language gives him away. He’ll almost assuredly be a part of that second season -- because he’s lately too smart not to be.